His beard is shaped like a heart. Before I glued my pieces together, I let my daughter use the pieces I cut out to trace her own pieces so she could draw and cut them out herself. She just turned 5 last month, and she made this whole puppet by herself! I am so proud! 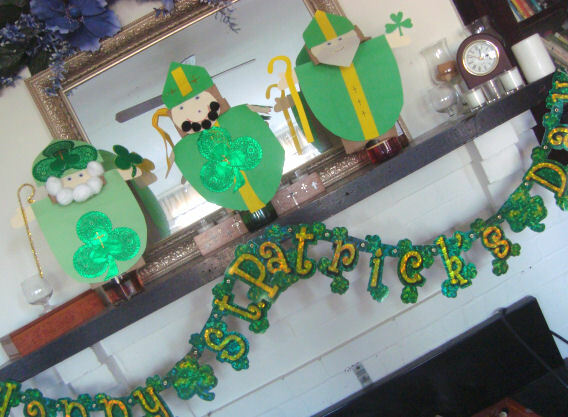 The one above has a pipe cleaner staff, and the doily shamrocks I got at Michael’s. I love them! 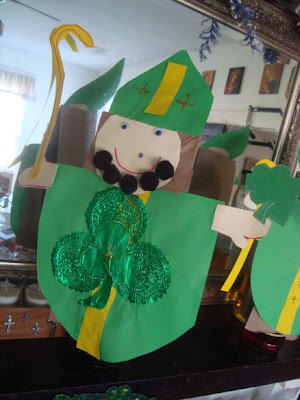 🙂 Wa also used some gold glitter glue to put the crosses on our shamrocks. 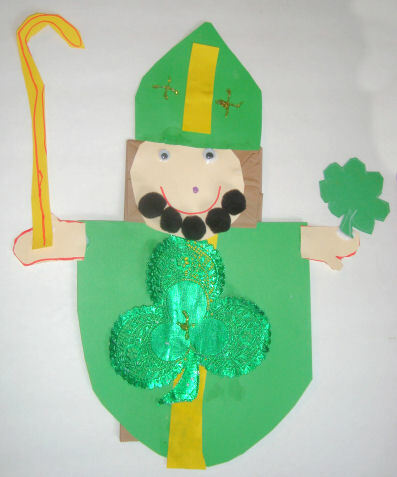 Remember while you’re doing this to explain to the kids how St. Patrick taught about the trinity using a shamrock. I decided they were so cute that I wanted to display them on the mantle in our dining room! So I just opened up the paper bags and slipped them onto liquor bottles. The cute banner came from the Dollar Tree. I love the beard mouth heart!!! 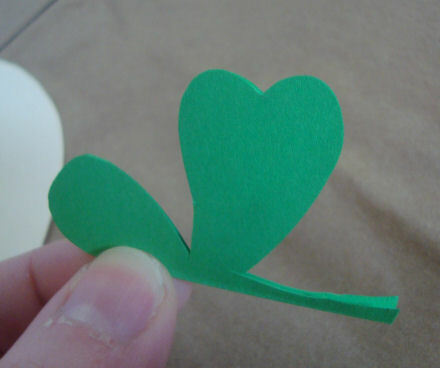 These are soo cute! LOVE the St. Patrick puppet! 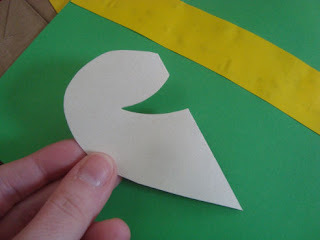 I hope to see more paper bag puppets soon!! I love the way you did the beard. Thanks so much, I'll be linking. 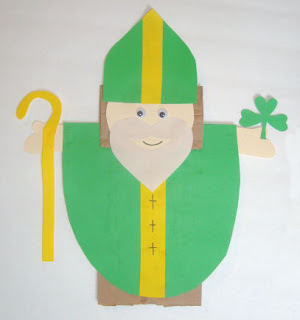 It's so nice to see a St. Patrick's Day idea that actually features St. Patrick! 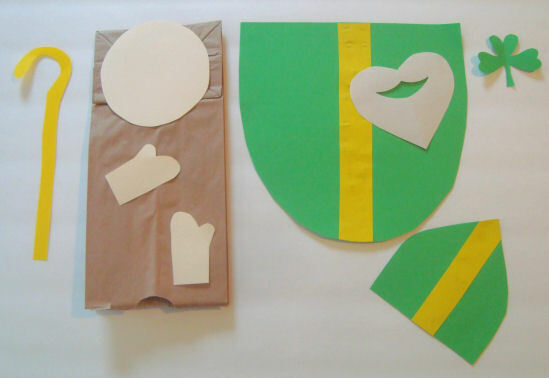 Thank you so much for this idea – I didn't find it until late Friday night and stayed up until 2am – making all the pieces for my Sat am CCD — They are 1st graders they loved it!!! Thanks so much for your great ideas!! Hello! 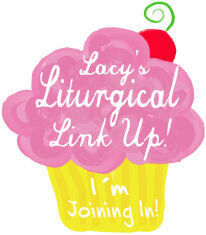 I hope you don't mind that I linked a linky to your linky…its just that it goes so well. 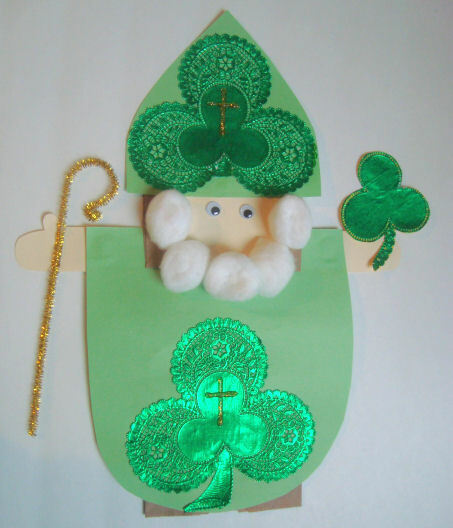 I hope you will add this post to the linky I posted…its a wonderful craft and just the sort of thing I was hoping to find, as my linky is about Celebrating St. Patricks day as a Christian holiday. I'm not Catholic…just Christian, but my Church follows the liturgical calendar somewhat (we're a surprizingly odd Baptist church…we read from the litergy, do lent, etc.). 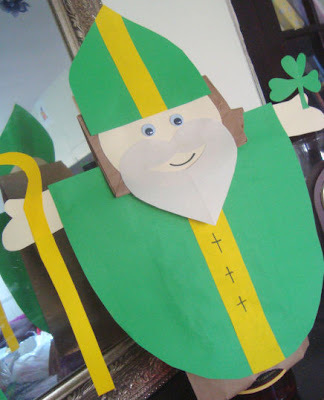 I'm new to all this, and though we don't do much that I know of for St. Patricks day, after learning about his life I want to learn more about the traditions and activites people do who do celebrate it as a religious day. It's why I started that little blog linky this year. Lacy~ I just love all of these bag puppets and this one is no exception! You are crazy creative…especially love those shamrocks you made from the doilies. 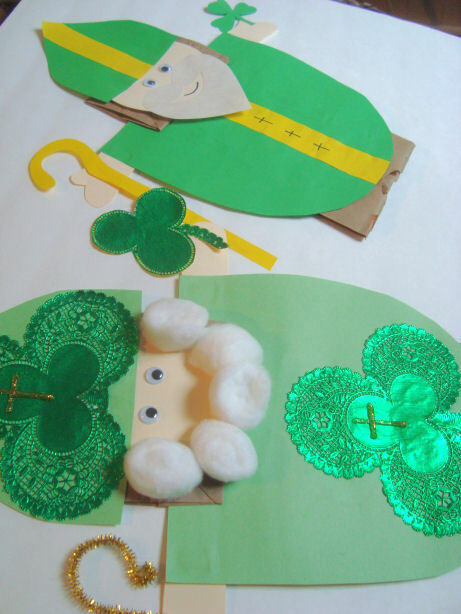 What fun decorations these make, too:-) Have a blessed St. Patrick's Day celebration!